Clan-Gifts.com - Scottish Clan Names - Clan Macdonald Store! Macdonald is the largest of the Highland clans, the Gaelic first name "Domnuill" was anglicised to "Donald". The original Donald was a grandson of the mighty King Somerled who drove out the Vikings in the 12th century. Somerled's mother was Norse and his father was descended from the kings of Dalriada, according to clan history. The family was founded in Islay and extended their territory to the mainland. Donald's great-grandson, "Good" John of Islay, became known as Lord of the Isles and later holders of the title became powerful enough to challenge the king of Scotland. The Lord of the Isles had its own parliament at Finlaggan on Islay. Eventually, the Lord of the Isles was defeated in 1493 by King James IV and the various branches of the clan evolved under their own chieftains. The main branches were Clan Donald of Sleat (in Skye), Clanranald (in Moidart, Glengarry, Lochaber and Glencoe). The Glengarry line adopted the spelling MacDonnell. The MacDonells of Keppoch were descended from Alastair, third son of John, first Lord of the Isles. Their lands were on the mainland in Lochaber; they were sometimes known as Clan Ranald of Lochaber. The last clan battle in the Highlands took place between MacDonell of Keppoch and Mackintosh of Mackintosh in Lochaber in 1688. The Clanranald MacDonalds were involved in both the 1715 (the clan chief was killed at the Battle of Sheriffmuir) and 1745 Jacobite Uprisings. Bonnie Prince Charlie landed in Clanranald territory in 1745. Many MacDonalds emigrated to North America and other parts of the world in the 18th and 19th century. 300 MacDonalds from Clanranald emigrated to Prince Edward Island in 1790 and MacDonnells of Glengarry settled in some numbers in Glengarry County, Ontario. MacDonald was the most frequently registered "mac" name in Scotland - it was the 26th most frequent surname at the General Register Office in 1995. The motto of MacDonald of MacDonald is "Per mare per terras" (By sea and by land). The MacDonalds of Clanranald and MacDonalds of Sleat have the motto "My hope is constant in thee" and the MacDonnells of Glengarry have the motto "Cragan an Fhithich" (The rock of the raven). As befits a large and powerful clan, the septs or sub-branches under the protection of the MacDonalds are many. The list provided by the Standing Council of Scottish Chiefs include Alexander, Allan, Allanson, Balloch, Beath, Begg, Bowie, Burk, Colson, Connall, Connell, Coull, Coulson, Crombie, Crum, Daniels, Donaldson, Domillson, Galt, Gilbride, Gill, Gorrie, Gowan, Gowrie, Hawthorn, Hewitson, Hewitt, Howison, Hudson, Hughson, Hutchenson, Hutcheson, Hutchinson, Hutchison, Isles, Jeffrey, Kean, Keene, Kellie, Kinnell, Leitch, Macallan, Macbeth, MacBride, MacBurie, MacCall, MacCash, MacCaul, MacCluskie, MacColl, MacConnell, MacCoish, MacCook, MacCosram, MacCrain, MacCrindle, MacCririe, MacCruithein, MacCuag, MacCuish, MacCutcheon, MacDaniell, MacDrain, MacEachan, MacElfrish, MacElheran, MacGeachie, MacGeachen, MacGill, MacGillivantie, MacGilp, MacGorrie, MacGoun, MacGowan, MacGown, MacHendry, MacHugh, MacHutcheon, MacIan, MacIlriach, MacIlrevie, MacIlvride, MacIlwraith, MacIsaac, MacKeachan, MacKean, MacKechnie, MacKellachie, MacKellaig, MacKellock, MacKechan, MacKiggan, MacKillop, MacKinnell, MacKissock, MacLardie, MacLarty, MacLaverty, MacMurrick, MacO'Shannaig, MacPhillip, MacQuistan, MacRaith, MacRorie, MacRory, MacRuer, MacRurie, MacShannachan, MacSorley, MacSporran, MacSwan, MacSween, MacVarish, MacWhannell, Mark, Martin, May, Murdoch, Murdoson, Murphy, Norie, O'Drain, O'Shaig, O'Shannachan, O'Shammaig, Park, Paton, Philipson, Purcell, Reoch, Revie, Riach, Ronald, Ronaldson, Rorison, Sanderson, Shannon, Sorely, Sporran, Whannell, Wheelan, Wilkie, Wilkinson. 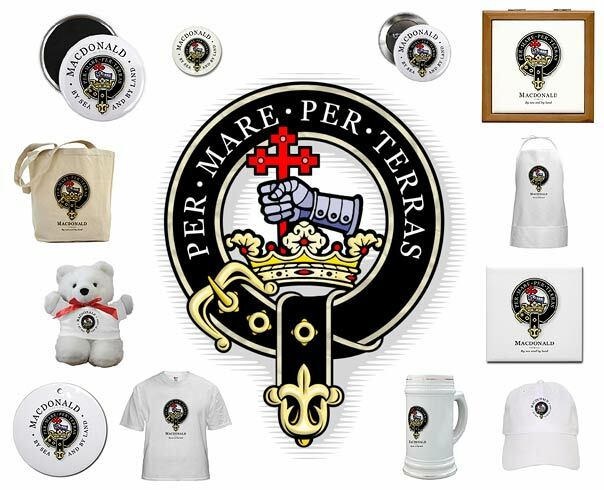 At Clan-Gifts.com we offer a wide range of quality Scottish gift Items, souvenirs, apparel and housewares, all printed with a beautiful rendition of your authentic Clan Macdonald crest! Our Clan Macdonald gift store stocks over 70 products*, and all items are fully guaranteed! Our great prices, low shipping costs and excellent customer support make us an excellent choice for Scottish Clan Macdonald merchandise!